The 2014 Sprint Cup season — my first full season in NASCAR's premier series — is under way and... it's not going go so well. 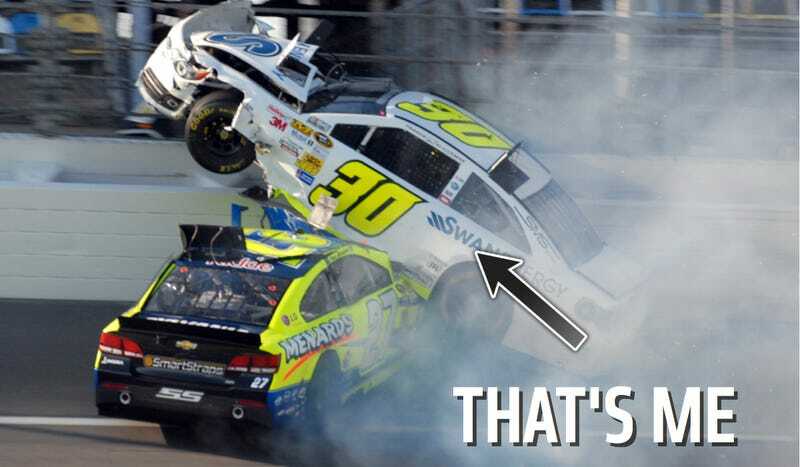 Here's what happens when a life full of preparation meets the catch fence at 200 MPH. After many scathing texts and emails from Jalopnik editor Matt Hardigree, like “Hey Bud, hows it going?” or “When do you think you will have another post?” I have finally compiled an update, due to trembling fear of repercussions. He’s a scary guy. So in typical “How To Drive Fast” fashion, my goal is to show you what NOT to do. Imagine you have worked your whole life towards one goal. It’s been the sole object of your affection and focus. Now that it’s all there, right in front of you, all that’s left is to go out there and do it. That was my mindset about 10 minutes before I started my first full season in NASCAR Sprint Cup Series, standing next to my car on the grid before my first Daytona 500. Ready to perform, ready to get it done and guide my team to the goals we had set. Ready to work with sponsors and gain partners of a larger scale for our organization. With Lending Tree onboard (Plug!) my No. 30 Swan Racing Toyota Camry and showing good speed in our qualifying race, it felt like it was all coming together, better then I could have planned. In the week leading up to that big day, I was involved in an incident that flipped my car over at 200MPH during a three-wide drafting practice session. Ironically, just before my hood slide, I radioed to my team and said, “The car is great, lets quit this practice.” Only moments later I was careening down the front stretch of Daytona (did I mention I was upside down?!) amidst a bunch of sparks and the sound of scraping metal. If only you could’ve heard the angry obscenities I screamed in my helmet. For those of you wondering, I’ll be honest: Flipping over at 200MPH is far less scary than I anticipated. And I’m not trying to sound like some macho racecar driver. As it happens, you brace yourself, allow the car to tumble, scrape and rip apart. Then you get severely angry that you lost a really good race car. Next, you hope you’re not about to get hit by another car while being suspended by your six–point restraint system. The best thing I can liken it to is the feeling of being pulled under water by a big wave at the beach. If that’s happened to you, you know the feeling. From there, I raced a Camping World Truck that I was proud of for a couple reasons, but none more then the fact that a company I have co-founded with a buddy of mine was one of the sponsors on the truck; Nootelligence (Plug!). We had a great race going, running in fifth for much of the race until I moved to the top line to have a shot of advancing position and was spun out by another competitor. My truck was destroyed and we didn’t have a good race result. The reality was that I got to scare him at 135 MPH in a street Camry, while in a ride along around Daytona only mere centimeters from the wall. We laughed, we talked about racing and music, and overall it was an awesome experience. Sunday was the Daytona 500, the “Super Bowl” of NASCAR, the biggest race in America. We started the race 43rd (or as we like to say “Shotgun” on the field), because we were in a backup car after the “inverted hood slide” incident. It was really a two-part race: we started during the day, in front of a crowd of 170,000+ eager race fans. We ran only 38 laps and then were suddenly bombarded by torrential downpours and tornado warnings. So after six hours, a glorious nap and several rounds of attempting to dry my race shoes in the motorcoach dryer, we were back to racing at 200+MPH. Then I had to laugh. For the third time in four days, I was in the same bed in the Infield Care Center, going through the same medical checks with the same nurses and doctors. They dubbed the bed “PK’ s Place.” We had finished 29th. Daytona is always a bit of a crapshoot, so I had to focus forward. The second race of the season was at Phoenix International Raceway. I felt I’ve had great speed there in the Camping World Truck Series and Nationwide Series, so it wasn’t surprising that for the first 30 minutes or so of practice, my No. 30 Swan Energy Toyota Camry was in first (side note: we were in qualifying trim and most the field was in race trim, but first is first)! We were looking forward to qualifying, realistically hoping for anywhere from 25th-30th. However, in keeping with our luck, we were on our fast lap and when the tires were their best, a car spun in turn four and caused us to have to abort the lap halfway through. It effectively took away a couple tenths from our next run, relegating us to a 36th place starting spot. We were looking forward to the race, though. We felt fairly confident in our car during race practice and we knew that strategy could pay off, along with some good old fashion race craft. So as we got going, during the first few laps I thought, ‘Here we go, we have a real race car!’ Then suddenly on lap 15, I started losing tremendous power in our engine. It eventually expired on lap two-hundred-something. So we finished 42nd and earned the dubious honor of being the only team to DNF (Did Not Finish) in the first two races. Yippee for mediocrity! All was not lost though, as we next headed to Sin City… Viva Las Vegas! We weren’t only looking for luck on the strip or in the strip clubs, but mostly on the race track. A test day on Thursday gave us great hope, as we spent much of the day in 13th place on the speed chart. As we went into the official weekend, we slowly slipped down the board, eventually qualifying in 32nd position. Then our engine blew in final practice. Replacing it put us last on the starting grid, again. So, with a new engine and a car we felt was going to be good in the hot, slick conditions, we set off in the race, gaining spots pretty quickly until eventually – yes, you guessed it – an electrical problem. I couldn’t rush to the throttle too quickly or the engine would sputter and stumble. So I drove with the delicateness of a tight rope walker in ice skates. I was able to maintain my position and even gained a few spots until the whole thing went, as the F1 Commentator Steve Matchett would say, “Kablammoo!” From there, we went behind the wall, re-did the ECU and the car was back running again. We eventually finished 41st. Yay, we are getting better… NOT. I have to note that the Vegas race was especially crucial, since it was the last race using 2013 owners points. That meant that going into the next race, we would be using 2014 owners points, which is what we use to be secured in the race, should you have a bad qualifying session. Going into Bristol we realized we had another added bit of fun for qualifying as we were now 43rd, dead last of the cars that had done all three races. Upside? We couldn’t do any worse! On to Bristol! The “Last Great Colosseum” is one of my favorite tracks and a place I have had a ton of success, including numerous top-10s in the Camping World Trucks and Nationwide, with a best finish of second in 2012. We knew this might be a tough Friday since we had to qualify in on time, but that was only the start. Only three minutes into the first practice, Danica spun while beside my car and slammed into the right side, as I was about to start my first practice lap. This eventually made it so we couldn’t complete but two runs at the end of practice. I have to note that, because of the amazing work by my crew, we were able to make it back out. During those two short runs at the end of practic, I realized (just to add to the surmounting “fun”) that my steering box was locking up in the center of the corners and therefore, stopping my ability to steer the car. In a lap that takes 15 seconds, that can be quite an issue. This continued in qualifying and put us 41st. Is it wrong to say whoever we beat should be ashamed, as I couldn’t even steer my car?! We actually had an awesome car come final practice and I felt very confident for Sunday afternoon. We ended up changing another engine after final practice, as we were worried about a part failure we had seen in the Vegas practice engine. This meant we started the race in – you guessed it – 43rd. I used to say I didn't believe in luck, but it's better than believing in karma at this point.